Bach’s French Suites seem to be ‘in the air’ at the moment. Murray Perahia’s set on Deutsche Grammophon (review) has become a latter-day reference point as far as I’m concerned, and this has been challenged if not beaten by Zhu Xiao-Mei on the Accentus label (review). 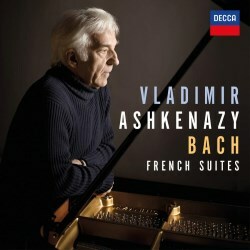 Vladimir Ashkenazy been building quite a pedigree in Bach in recent years, and fans can add these French Suites to previous releases of the 6 Partitas, Italian Concerto/French Overture and Das Wohltemperierte Klavier on the Decca label. These have been received with mixed reviews, but with Ashkenazy’s reputation and my admiration for his recordings of Beethoven and the Romantic and Russian repertoire led me to explore. Alas, the overall conclusion with these French Suites is ‘mediocre’ – a mark that, at times, might even seem a little on the generous side. Ashkenazy’s tempi are brisk on the whole, but that is not a negative point. I admit to having become used to more ruminative tempi from Perahia, but also enjoy Glenn Gould’s crispness. Ashkenazy doesn’t go in much for extremes, and so there is a quality of sameness that allows your attention to drift quite early on. Those wonderful Sarabande movements are of course moments of repose, but the lyricism and expressiveness often seems to fall betwixt and between – more straightforwardly lyrical than profound, which is fine, but with a vagueness of shape that makes them not particularly songlike either. Evenness of rhythm is a problem in many movements, with notes snatched a little early here and there, and a hobbling long-short micro-limp on semiquaver runs. Trills and ornaments lack character and at times accuracy, and there are splashy moments where left and right hand become dislocated momentarily… the list of distress goes on rather ad nauseam. If you were listening blind, unaware that this was the work of an international superstar and legend of the classical music concert podium, then I doubt you would give it much above a 5 out of 10 mark. The quotes in the booklet note also do not inspire confidence: “I tried to have as clear a sound as possible…” is the performer’s main point, something you might expect from a second-year Bachelor degree student. There are no thoughts as to what might lie behind the notes, nor any personal associations. “The music is more simple [than the English Suites or Partitas], but some numbers are still difficult to play… I enjoyed learning and playing it very much.” Come on people: there has to be more to a recording than this for a leading label to consider making such a release.